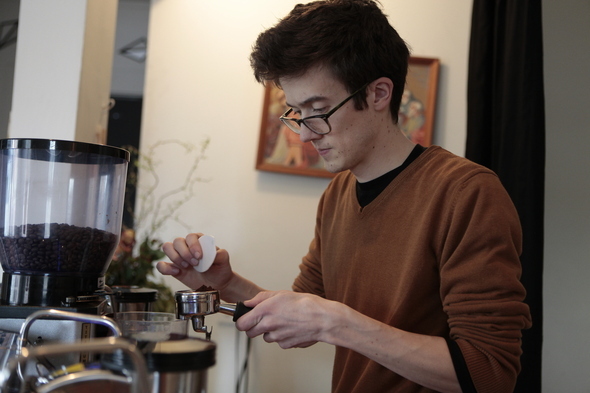 Posted on Mon, Mar 12, 2012 : 5:59 a.m.
Espresso Bar Co-owner Sandy Bledsoe makes a cup of coffee. Three months after The Bar at 327 Braun Court opened in Kerrytown, a new business has temporarily taken over the first-floor of the building: a coffee hangout called the (espresso) bar. Co-owners Anna Foster, who goes by Foster, and Sandy C. Bledsoe III opened the shop March 1 and plan to remain in the space for three or four months. The plan from there, Foster said, is up in the air. This building in Kerrytown's Braun Court houses The Bar at 327 Braun Court and the (espresso) bar. 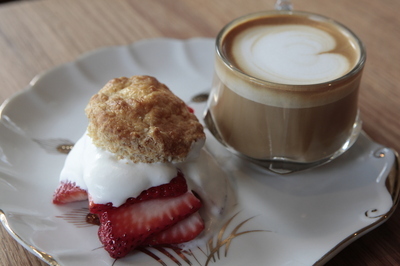 Strawberry shortcake and a latte adorn a plate at the Espresso Bar. The (espresso) bar is set up with two espresso machines and a single espresso grinder on a metal cart on the bar’s first floor -- which opened in November on the second-floor of the building and utilizes the first-floor for film screenings. 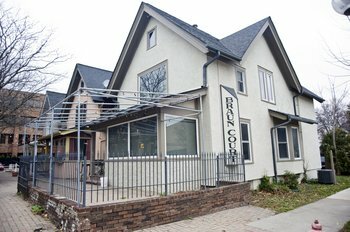 The bar still hosts film screenings, but Foster and Bledsoe said there was room for collaboration between the (espresso) bar and The Bar at Braun Court. “The feel upstairs is very much a neighborhood, casual bar with very high quality products,” Foster said. And with seating for about 10 to 12 people right now and plans to possibly add more, they said the goal for the (espresso) bar is to also become a neighborhood hangout spot. “We’re making a space where people can feel comfortable and come in, have a coffee and hang out,” Bledsoe said. The (espresso) bar offers a mix of espresso drinks, ranging from a standard latte or mocha to espresso served with goat milk. It also carries tea from Ann Arbor’s TeaHaus. Foster said the prices are comparable to other local coffee shops, with an Americano priced at $2.50 and a latte at $3.50. Customers can get a drink to go in a paper cup, or have the option of getting a drink in a reusable glass jar with a lid for $1 extra. The business also serves items such as homemade scones, Zingerman’s baguette with jam and other treats that Foster prepares herself. Last week, they served homemade French toast on the weekend. Foster and Bledsoe, who both have a passion for coffee and worked at Ann Arbor’s Comet Coffee for some time, said they’d been toying with the idea of opening their own shop for more than a year. The small space at The Bar at Braun Court presented them with the perfect opportunity where they could open for a few months and then choose how to grow from there. After being open for less than two weeks, the duo has already toyed around with more business ideas, including adding another espresso grinder to offer a variety of espresso beans, starting a board game night, and catering for events such as meetings or weddings. For the month of March, Foster and Bledsoe are also donating a portion of their tips to Dawn Farm, and in May, they are partnering with 826michigan. The (espresso) bar’s current hours are Tuesday through Sunday from 8 a.m. to 5 p.m.
Mon, Mar 12, 2012 : 7:51 p.m.
Mon, Mar 12, 2012 : 6:07 p.m.
Congrats Sandy and Foster. Wish you two the best of luck. This place should do very well. I know there are comments on here about Zingermans and Sweetwaters, but quite honestly, the coffee doesn't even compare. You simply cannot get a good espresso drink at Sweetwaters. That's not a knock against them either, I get their coffee all the time, but a pour over and/or an espresso drink crafted by these two is far better. You also have to have the time for a pour over so Sweetwaters is a quick and pretty good fix. Zingermans may be a step up in terms of espresso drinks from Sweetwaters, but who wants to pay twice the price for half the portion. Again, no knock on local businesses here, but if you're a serious coffee drinker, the espresso bar is the only place to go in Kerrytown. As for all the negative comments here, what the _____ are people thinking. I cannot see how anyone can think of anything to say about this, same to those saying &quot;we need another coffee house in AA&quot;. What do you do that's so special besides sit at home and judge. Mon, Mar 12, 2012 : 11:32 p.m. It's always the same posters with negative comments. I could name most of them but that would get my post deleted. Save your breath. They think they have it all figured out. It's pointless to argue with them. Mon, Mar 12, 2012 : 5:26 p.m.
Gratz to Foster &amp; Bledsoe! Nothing wrong with another good coffee bar, best of luck to you. Mon, Mar 12, 2012 : 4:17 p.m.
Great article for someone like me who lives out of town but frequents Ann Arbor from time to time visiting family. We will definitely have to put this on our itinerary! Wow, an espresso bar, we need another espresso bar, there because it would be out of place to not have one where ever direction you look down town. It's needed for one will know they are still in A2. Mon, Mar 12, 2012 : 3:19 p.m.
Mon, Mar 12, 2012 : 3:11 p.m.
Mon, Mar 12, 2012 : 3:01 p.m. Your attitude is pathetic. Did this article really warrant three negative responses? Mon, Mar 12, 2012 : 2:10 p.m.
&quot;Honest local folks getting serious about entrepreneurship&quot; What are Zingerman's? What are Sweetwater? Crooks and big corporations? Please, stop this... these are hipsters TRYING to keep their dream alive. Mon, Mar 12, 2012 : 4:54 p.m. Honestly: why make this into a space for disparagement? I sincerely do not understand. It puzzles me. I have no bad things to say about either Zingerman's or Sweetwater, and am happy for those businesses to flourish on the scale at which they operate and in the form that they take. They're great local economic drivers and I hope they can continue to help hold the fort against the depressing chain commercialization sweeping through the Liberty Street area. But other people owning their own business and making something happen is nothing but a positive thing either. The existences of Zingerman's and of the espresso bar are in no way mutually incompatible. Again, why stoop to name calling and disparagement? If the espresso bar flourishes, what's it to you, and what's it to Zingerman's or Sweetwater? Anyway, best wishes to Foster and Sandy again. Yay, I love the changes to this area! Look forward to stopping in and hanging out. Mon, Mar 12, 2012 : 1:36 p.m.
Yay, I love the changes to this area. Look forward to stopping in and hanging out. Mon, Mar 12, 2012 : 12:38 p.m. Here's a great story about some honest local folks getting serious about entrepreneurship and keeping Ann Arbor the way we like it, which is such a phenomenally positive thing after all this genuinely depressing junk about Tim Horton's and smoke shops taking over Liberty Street. I just hope the commenters here can recognize a good thing when they see it. I wish Sandy and Foster the best, and I'm incredibly happy to see cool and positive things being done by local people for this town. Keep it real guys; keep serving coffee the way you like; and definitely start up a game night! I'll come by. Mon, Mar 12, 2012 : 12:37 p.m. I don't know the market demand for another coffee shop in AA, but gotta love the entrepreneurial spirit in this town (particularly when it's coming from the younger generation)!! Mon, Mar 12, 2012 : 12:28 p.m.
Can I get boiled eggs there or do I need to head upstairs to The Bar?